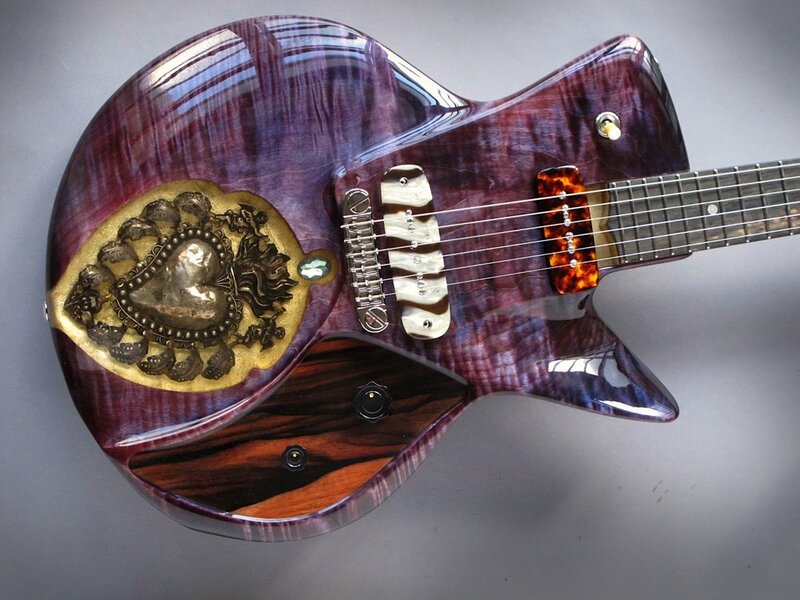 Based on a short story by Oscar Wilde, “The Happy Prince”, this piece continues my OW cycle - (view ‘The Fisherman and his Soul’) - combining a guitar with a cabinet and amplifier. Hand carved door panels depicting the Prince and the bird in a art deco manner, finished in gold leaf, slide apart to reveal the guitar. 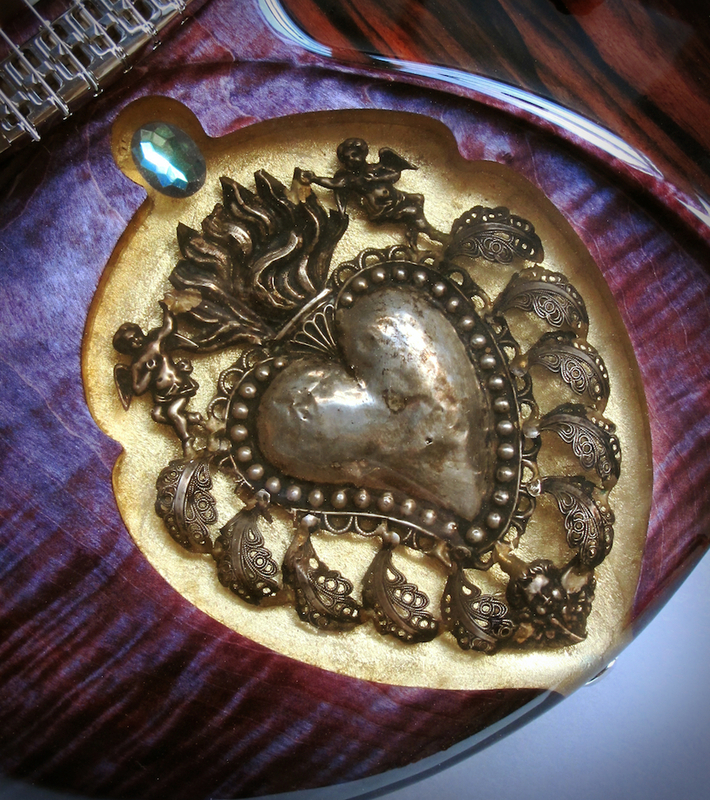 Fashioned from a single piece of stained flame Maple, with a flame Maple neck and figured Ebony fingerboard, this instrument contains a 19th century silver votive heart. Completing the assembly is an amp by Tommy Aguilar (Apache Amps). The amplifier inside the cabinet is rated at 25-28 watts. It is based on a vintage 50’s preamp type volume and tone setup with two separate channels and one simple tone control. “V1” is the volume control for the number 1 input and “V2” for number 2. Number 1 channel is normal with a little deeper bass than channel 2, which is brighter and more open sounding. The tone or “T” knob balances between two different tone capacitors to adjust between a full rich Bass tone and a strong upper Treble biting type signal. When the tone knob is turned up you will notice that it also seems to add volume and gain to the signal. Volume controls are pretty sensitive with this type of preamp so it might take some time to get used to the adjustments. The output section is fixed bias and has a great clean and clear signal going out to the speaker. Tubes are from right to left, looking from the rear of the chassis: 12AX7, 12AX7, a pair of RCA 6V6GTA and a GE 5V4 rectifier tube. If the output tubes need to be changed (they should last a long time! ), they will need to have the bias current adjusted by a qualified tech. The speaker inside the cabinet is a “Scumback” M75 PVC (paper voice coil) rated at 65 watts at 8 ohms. There are two output jacks, the “ext” is for an external speaker cab. 16 or 8 ohms will work fine. If you want to use another cabinet without the internal speaker, use the “1” jack into an 8 ohm cabinet.